May 2005 - - The Atomic Safety and Licensing Board has rejected Utah's latest appeal seeking to prevent Private Fuel Storage from storing 44,000 tons of nuclear waste on the Skull Valley Goshute Indian reservation. The board's decision means PFS closer to getting its license to build an interim spent fuel-rod storage site 45 miles southwest of Salt Lake City. PFS officials have said they could be operating by 2007. 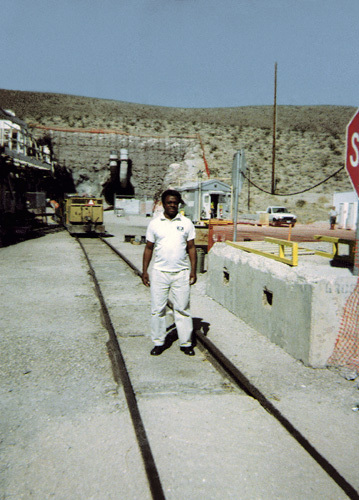 AAEA President Norris McDonald's visit to Yucca Mountain on April 29, 2002 was informative. It was an interesting tour. It satisfied any remaining questions about the "sound science" of selecting this site as the permanent repository for our nation's nuclear waste. More money has been spent, and this site has been studied longer, than it took to land a man on the moon and to create an atomic bomb under the Manhattan Project. Although additional studies are required, the time for study is over. Let's approve and build this project now. McDonald is a chronic, acute asthmatic, and was a little concerned about riding 90 miles northwest of Las Vegas through the desert and then going 1,000 feet under a mountain. He took his respirator and wore it on the underground tour. He also viewed the entire region from the summit. It is a truly desolate area. The hundreds of atomic bomb tests were conducted north of Yucca Mountain. Fortunately, He didn't have any asthma trouble at all. It wasn't that dusty in the tunnel (25 feet in diameter). We understand that he did put a few quarters in a couple of slots while passing through Las Vegas. He also ate at a restaurant at Mandalay Bay and shook hands with former President Bill Clinton at the MGM Grand after dinner at the Coyote Cafe.